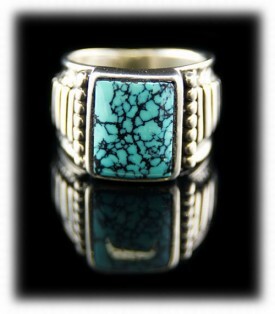 Durango Silver Company has been producing a wide variety of Southwestern style Mens Band Rings for nearly 40 years. Our Mens Band Rings are handcrafted in the USA and are substantially different from others, they are only available in our Online Silver Gallery or at our Jewelry Store located in Durango, Colorado. Durango Silver Company is located in Durango, Colorado USA. If you are considering a Mens Silver Band, check out our ever growing selection of high quality Mens Band Rings! Below are several examples of Mens Band Rings that you can find at Durango Silver Company. Above and to the left is a Native American handmade Silver Mens Band Ring that has been inlaid with green Turquoise and Opal. This is a smooth and sleek Mens Band Ring that can be worn by men or women. The inlaid gemstones are set into channels of the ring and then cut, polished and contoured to the shape of the band. Durango Silver Company tries to always have a good selection of Native American Silver Mens Band Rings on hand at all times. 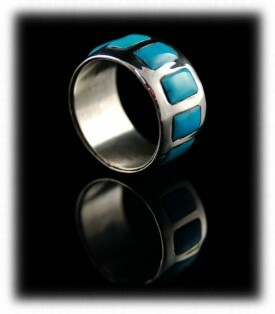 To the right is a Mens Band Ring created in Sterling Silver with a Turquoise Gemstone by Dillon Hartman. This Mens Band Rings is easy to wear and will not easily get caught up on obstacles when a gentleman is working with his hands. This Mens Band Ring is inlaid with a Turquoise gemstone, we can make this ring with many other types of gemstones as well, they must be ordered. John Hartman of Durango Silver Co has been creating his unique Saddle Mens Band Rings since the 1970's when he dealt in Silver Saddles and American Frontier Cowboy items. This unique Mens Ring is like no others as John was a horseman and designed it to fit a gentleman's finger like a saddle fits a horse - and it does! Above and to the left is a Gold Mens Band Ring that was handcrafted in 14kt Gold and than inlaid with Lander Blue Turquoise by Dillon Hartman of Durango Silver Company . This Lander Blue Turquoise Mens Band Ring has a wonderful Lander Blue Turquoise Gemstone from the most famous Turquoise mine in the world, the Lander Blue Turquoise Mine of Nevada USA. The Gold work on this Gold Mens Band Ring was created by John Hartman in a Saddle Ring setting and then finished by Dillon. To the right is a heavy Mens Band Ring in our Saddle Ring style with a Tibetan Turquoise gemstone. This is very nice ring for a man, classic and easy to wear every day due to the way is was designed. This Mens Saddle Ring has a lot more detail that can be seen on its presentation page, go check out this beautiful Mens Band Ring g now by following its link. Above and to the left is a Mens White Buffalo Turquoise Ring by Dillon and John Hartman. This Silver mens band ring has a white Turquoise stone that fits well with its simplistic and sleek design. This is one of the most comfortable sterling silver mens band rings you will ever buy as it is one of Johns saddle rings. The White Buffalo Turquoise stone is inlaid and surrounded on two sides by a cable design. The band has a stamped design going down each side of the band. The ring was fabricated by John Hartman and inlaid by Dillon Hartman. To the right is a Silver Mens Band Ring created in the saddle design by John Hartman and inlaid by Dillon Hartman. 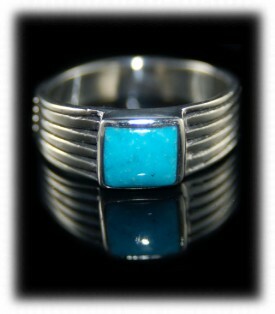 This Men's Silver Band Ring has a square Sleeping Beauty Turquoise cabochon. This "Robin's Egg Blue" Turquoise stone is set in a sterling silver bezel atop a simplistic and modern Silver saddle mens band ring. You can view additional photos of this Silver Saddle Ring on its presentation page. Above and to the left is a Mens Band Ring by Dillon Hartman. 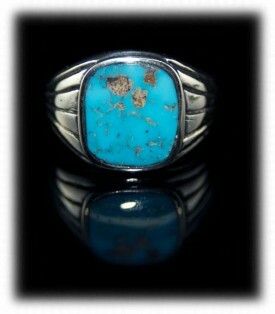 This mens band ring has gorgeous rectangular Bisbee Blue Turquoise stones inlaid all around the Sterling Silver band. This mens inlay Turquoise ring features a comfort fit band. This Mens Band Ring was handmade in Durango, Colorado by Dillon Hartman and is hallmarked “Dillon” and “Durango Silver .925”. You can see more photos of this inlaid Mens Band Ring on its presentation page by following this link. To the right is a silver mens band ring that was Native American handmade by Julius Burbank, a Navajo Indian. 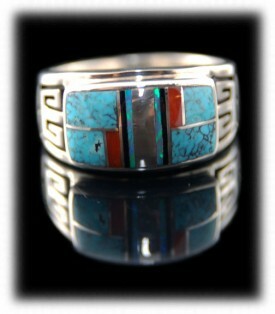 This is one of our best selling Native American inlaid Sterling Silver Ring Bands. 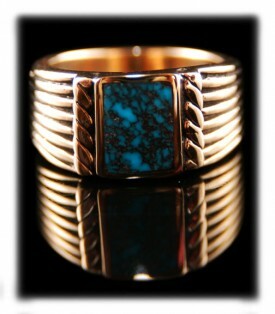 This mens band ring has bright blue spider web inlays of Turquoise from the Lone Mountain Turquoise mine in Nevada. The Turquoise is accented by Mediterranean Coral, Black Onyx and Fire Opal. This men’s band ring is so intricately inlaid that you could look at it in a magnifying glass and not be able to see any spaces between any of the individual gemstones. Take a better look at this amazing Mens Silver inlaid band ring on its informational page. Check out this wonderful Saddle Ring by John Hartman - it was created in Sterling Silver, inlaid with Colorado Gold Nugget and has an Oxblood Mediterranean Coral Gem of a stone. 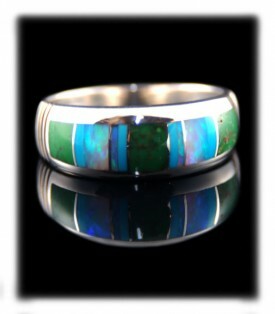 Now this is one great Mens Band Ring from Durango Silver Company! We hope you liked this informational presentation on Mens Band Rings and have gained some useful knowledge from it. We invite you to learn more about Native American Jewelry and Sterling Silver Jewelry by following the links in our Learning Center to other informational pages that we have written on different topics related to Silver Mens Band Rings. In addition, we would like to invite you to join our E-Mail Newsletter - about once every other month we send out a Newsletter to inform our members of what's happening with Durango Silver Company, new products, specials for our members and more. We also have a monthly drawing from our member base to give away free Silver Jewelry from our company. Please take a moment to become one of our friends by signing in below. We hope you have enjoyed our presentation on Mens Band Rings and we also hope you will think of Durango Silver Company the next time you are considering Mens Band Rings.